"If you're having problems, they'll take your kids anytime they want," said Robert Wabasha, of the Santee Sioux Nation, whose granddaughter and grandniece both died after being adopted out of his family. The granddaughter died at the hands of her adoptive father while a baby, and the grandniece recently drowned at age 5. 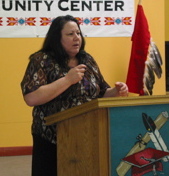 Wabasha (shown below) and other Native people testified about experiences with Iowa's child-welfare system before the Iowa Commission on Native American Affairs during a two-day meeting at Four Directions Community Center in Sioux City, Iowa. Fear and outrage permeated stories heard by ICNAA and other attendees, including attorneys, ICWA (Indian Child Welfare Act) specialists from the Ponca and Santee nations, and representatives of the governor, Siouxland Human Investment Partnership, and the Native American Unit of Iowa's human services department. "There's a feeling you're never safe," said commissioner and Four Directions program manager Judy Yellowbank, who's from the Winnebago Tribe of Nebraska. "Even people who have, for example, legally adopted a grandchild, can't be sure the child won't be taken away." Preston Daniels, director of Iowa's human rights department, under whose umbrella ICNAA operates, addressed Native parents' sense of dread, saying, "Helplessness is terrifying." He also commended ICNAA's proposed solutions, including a bill to be introduced in the state legislature's 2011 spring session to restore parental rights to those who have lost them -- currently a permanent loss -- and to ensure grandparents' rights. Daniels called the bill vital: "The relatively small Native population is in danger of losing its next generation, and therefore its heritage. Many are losing parental rights at a young age. However, every study shows that people generally mature out of youthful indiscretions at around age 25." They should have a second chance, Daniels said. "Children need their parents." And parents need their children, said Four Directions' executive director Frank LaMere, from the Winnebago Tribe of Nebraska. He recounted the suicide of a young woman who'd lost custody of her child and added, "Our Anishinabe relatives tell us children choose their parents when they come into this world. A parental-rights bill would sustain those relationships." In an afternoon of testimonials, speakers described leaping through what Rosalie Two Bulls, from Ho-Chunk Nation of Wisconsin, called "hoops of fire" to prove they were competent. Two Bulls, a mental-health professional working on a Ph.D., reported being told she is too old to adopt her grandchildren. Antonia Ybarra (shown right), also a Nebraska Winnebago, got certified as a foster parent to prove she was qualified to adopt her young relatives. Ybarra, who spoke at a 2009 Congressional briefing arranged by The Alliance for Racial Equity in Child Welfare, teared up as she explained that she had to divorce her husband of 23 years so his legal problems wouldn't prevent her from having the kids. "Even though the kids are legally adopted now, we're afraid to remarry until they turn 18," she said. Though the child-welfare system appears efficient at removing Native children, it seems ineffective when help may be needed. Reginald White, from the Red Lake Band of Chippewa, testified to the commission about roadblocks and hostility he was experiencing as he attempted to gain custody of his young son. "He's such a great, outgoing kid, but I'm seeing changes in him," White said. "He keeps asking me, 'Dad, when am I going home?'" Tony Wood (shown left), who's Yankton/Winnebago, held up a photograph of his 3½-year-old twins. "My children have been missing for 34 days, and I'm barely holding on," he said. "I believe they are in danger, and I believe I have fathers' rights, but no agency will help me. In recent months, I have been totally responsible for their needs. Now I don't know where they are or even if they're eating. I have a good job and supervise a staff, and my wife's lawyer is saying I can't see my kids because I'll take them and 'run to the reservation'." Misinformation, such as the idea that reservations are beyond the law, poor understanding of Native cultures, and uncooperative court officials complicate matters in overburdened child-welfare systems. An area newspaper's investigative report and anecdotal evidence from Sioux City attorneys have also suggested that adoptions may be a lucrative business there. And some officials may not realize how aggressively they must pursue ICWA requirements, using "active efforts" to keep Native families together, to find a child's tribe, and more. Moving forward, ICNAA will develop cultural-competency training, work to ensure better home studies, and encourage recruitment of Native foster families. Commission chair Judy Allen, from the Ponca Tribe of Nebraska, was adamant: "In working with the system, we don't want to turn our Native families into white families and our kids into white kids."